The Bamboo Copper Wall Fountain comes complete with an electric pump. Available to order in Grey colour only. Normally available 2 weeks from order. Can be viewed at our display centre. 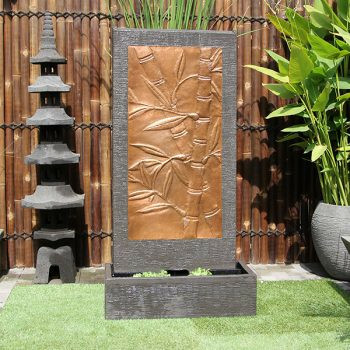 The Bamboo Copper Wall Fountain comes complete with an electric pump. Dimensions; 160cm high Base 80cm W x 40cm D x 23cm h Available to order in Grey colour only. Normally available 2 weeks from order. Can be viewed at our display centre.